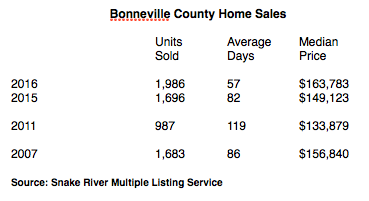 With 2016 well behind us now, we figured it was time to look at how real estate fared in Bonneville County. Crunching the numbers, we think it's fair to say it was the best year ever, surge well ahead of 2015 and even 2007, the last year home sales were in triple digits for all 12 months. Home sales in 2016 rose 17 percent over 2015. Homes sold faster, while at the same time the median price rose 9.8 percent. I think it's fair to say we have a seller's market on our hands, but I'd be interested in hearing what others have to offer.